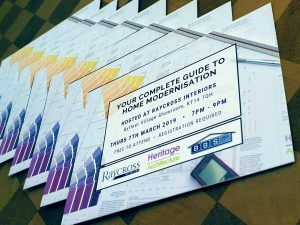 Last week we hosted our inaugural ‘A Complete Guide to Home Modernisation’ event at Raycross Interiors in Byfleet and Heritage would like to thank all of you who attended! It was indeed a successful evening. 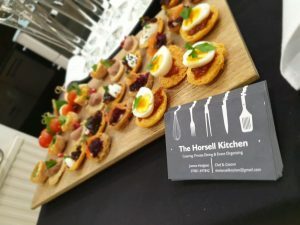 The evening started at 7pm with around 40 guests being greeted with a glass of champagne and delicious canapes from The Horsell Kitchen on arrival. Representatives from Heritage Architecture, Raycross Interiors, Bishop Building Services, Oakwood Mortgages and Waterfalls Sales & Lettings were all on hand to answer any questions on a 1-2-1 basis before and after the main presentation. Mike Tibbotts from Heritage Architecture gave two presentations throughout the evening talking about the journey of carrying out a home improvement project. This included brilliant advice about who to talk to, at what stage and time-scales for each of the stages of a project. 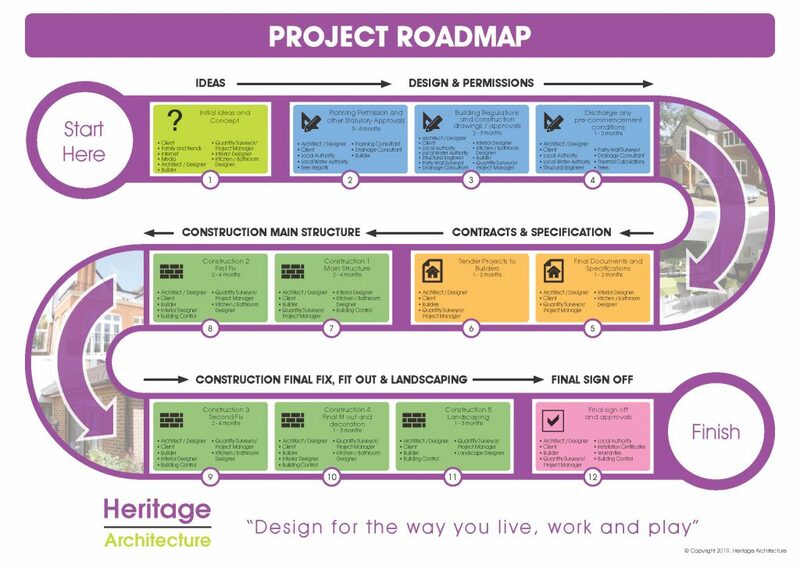 Guests were invited to take away the Project Roadmap which illustrates the various phases from initial ideas through obtaining planning permission, and on to construction and then final sign off and approvals. The whole evening was such a success and we had such positive feedback; we have decided to hold another similar event again next year so if you missed out, keep watching out on our social media pages for next year’s dates!